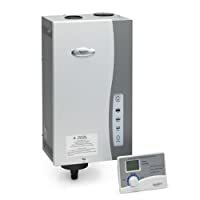 There are many humidifier providers online and home center stores where you may possibly become overwhelmed with what to buy. You must first know the reason you are buying a humidifier and what you want to accomplish. You want to know the features and functionality and trust the supplier you plan to buy from. We have put this guide together to help you make a wise decision for your purchase. There is more awareness today about having humidity in the home. Winter brings dry air along with the cold for outdoors and inside the home. Warm and dry climates, including home heat sources, reduce humidity. Retrofitting a humidifier to your existing gas-forced air furnace is a great solution requiring only that you adjust the humidity level to where it’s comfortable and beneficial. The ideal home humidity is between 30% and 50%. If it’s higher, your windows will drip condensation and mold can grow. Humidity extends the life of wood furniture, floors, artwork, and papers. When do You Need a Whole-House Humidifier? Whole-house humidifiers are usually controlled by humidistats that detect moisture in your home’s air. They let you choose and sustain the humidity level either using a digital or manual model available. You will be running your furnace blower system with the whole-house humidifier as well. Moreover, that’s a plus, since you don’t need to do anything—except for seasonal maintenance. 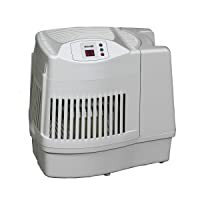 The other option is to run a portable unit that requires more maintenance and does not humidify the entire house—it is used for individual rooms. Whole-House Humidifiers—are attached to a new or existing furnace with a separate water pipe or tube from the plumbing in the house. There are several types available where one type injects a water mist into the airflow in the ductwork. Another type uses a foam cylinder rotating in a tray with water that blows through and around it. The whole-house setup lets you keep your humidity level at your desired percentage. You will never need to fill any tanks or worry about it running dry. It makes no sound and the initial cost is not as costly as portable units are. They cost only pennies each year to operate. There are systems offered for baseboard or radiant heat systems. Everyone can have humidity in his or her environment today without a problem. Humidity not only provides health benefits, it also keeps furniture, floors, plaster, musical instruments, and electronics from drying out, warping, cracking, and deteriorating. Wallpaper will start to crack and peel off. Humidifying units need to be installed by a professional or it can be done by you. Some units do accumulate mineral deposits and it is vital to clean it with diluted distilled clear vinegar at the end of your heating season. When the deposits from hard water solidify, they are difficult to remove, yet it can be done. Some homes use soft water systems and that would be a plus for the whole-house humidifier system. For more types of Whole-House Humidifiers, please click here. 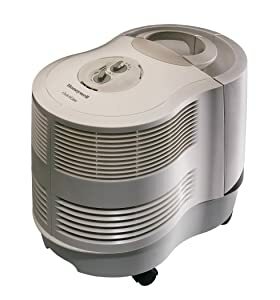 Portable Humidifiers—stand alone, usually with casters to move from room to room, and have a water reservoir that you fill and maintain. They are electric and plug into a standard 120-Volt outlet. Several rooms at one time can be humidified with more powerful portable humidifiers. Additionally, small tabletop units are in the marketplace but do not have a large range of coverage—enough for a small bedroom or office cubicle space. The portable unit is perfect for a renter or a student in a dorm room. They are efficient and will keep a smaller space humidified. On the downside, a best portable humidifier is more expensive than a whole-house humidifier. The furnace’s blower is used for the whole-house unit whereas a portable unit has its own blower to use its own energy. Portables are heavy, and a little noisy. Maintenance is done more often, depending on how often it is used, and the water reservoir needs to be filled almost daily. Some units have removable tanks and others need water taken to them. They must be kept meticulously clean. Standing water is the home for bacteria, mold, mildew, and fungus just waiting to be emitted into the indoor air you breathe. That would have an adverse impact for allergy and asthma sufferers. You will feel warmer when your home has humidity. You will not need to turn the heat higher with humidity to keep the house perfect. A low humidity level fosters health issues such as nosebleeds, dry and congested mucous membranes in the sinuses and nasal passages, dry coughs, dry skin, chapped dry lips, and respiratory congestion. Low humidity can cause allergies and asthma flare-ups. It is only wise to have additional humidity in your home’s air. With a whole-house humidifier, you turn it on and forget it. We will discuss here the best whole house humidifier for your consideration and review. With these considerations in mind, look over the best-selling and top-rated humidifiers listed below to have an informed assessment for what’s available in today’s marketplace. 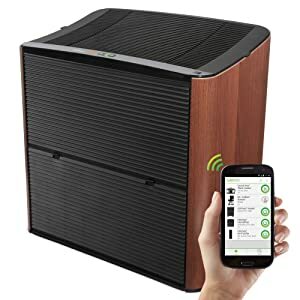 The AIRCARE® is a console-type portable whole-house evaporative humidifier that covers 3600-square feet with its 3.6-gallon tank dispersing up to 12-gallons of water into moisture within a 24-hour period. It uses a digital humidistat that automatically maintains your chosen level of humidity. The unit automatically shuts off when the humidity level is reached and when the water tank is empty. The evaporative wicks trap minerals and it’s easy to clean. It operates smoothly with no pulleys, belts, or wheels. The white housing has casters on the bottom to move around easily. The motor is a variable 3-speed and is quiet using the nighttime setting. Indicators show to check the filters and refill the water tank. It uses MAF1 replacement wicks available at Amazon. The cord plugs into a standard USA 110/120-Volt outlet, and is UL listed. The dimensions are 23.5” W x 21.5” H x 16.5” D and it weighs 13.5 pounds. It comes with instructions and a User’s Manual and a 2-year Limited Warranty that requires a sales receipt for claims for 2-years from date of sale on the unit, and 30 days on wicks and filters, which are considered disposable components and wicks should be replaced periodically. The User’s Manual might be in the filter area; best to check before filling with water. Essick Air® has been manufacturing humidifiers for 95 years. The designer series of Essick® humidifiers has a digital display on the control panel on the front above where the water is filled with its pour-in drop-down opening. The espresso color will go with any décor. The digital humidistat lets you sustain the humidity level of your choosing with accuracy with the actual humidity or your preferred level of humidity. The humidifier shuts off automatically when your desired humidity is reached or when the water reservoir is empty. The reservoir has a 3.5-gallon capacity and will run for 60 hours. The AIRCARE®/Essex 1043 SuperWick replacement is available at Amazon. This pedestal-style unit humidifies 2500- to 2800-square feet with its variable 9-speed motor. The automatic shut off allows you to set it and then forget about it. The SuperWick is included and 4 casters are included to put on or leave off. The unit plugs into a standard USA 110/120-Volt outlet, and is UL listed. The dimensions are 17.6” W x 27.5” H x 17.6” D and it weighs 23 pounds. It comes with instructions and a User’s Manual. The Warranty is 2 years from date of sale on the unit, and 30 days on wicks and filters, which are considered disposable. Proof of purchase must be provided. This model for Aprilaire® is a whole-house humidifier that humidifies up to 4200-square feet. It has an automatic digital control dispersing 0.75-gallons of evaporated water each hour. 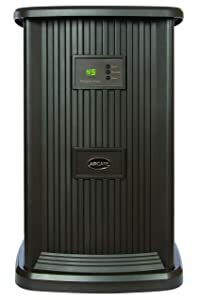 It is among the highest capacity humidifiers in the marketplace. It delivers 50% more moisture than its competition. It uses an outdoor temperature sensor to monitor any changes in the outdoor temperature. Additionally, the temperature and relative humidity is displayed in the manual mode also. It runs whisper-quiet and requires very little maintenance. The power is USA 110/120-Volt, 60 Hz, 0.8 Amps, and is UL listed. The dimensions are 15-29/32″ W x 15″-31/32″ H x 10-11/32″ D and it weighs about 10 pounds. It comes with instructions and a User’s Manual. Aprilaire® humidifiers carry a 5-year Limited Warranty on parts from the date of installation when installed by a licensed HVAC (Heating Ventilation and Air conditioning) installer. If not done by an HVAC contractor, the warranty is void. The Holmes® humidifier allows you the simple convenience of remotely operating the unit using your Wi-Fi® network and mobile Internet with your smartphone anywhere. Check the humidity level, and get an alert when the water is running low. Adjust settings and operation on your smart device. It will also send you a reminder when the two 17 x 9-inch filters need to be changed linking you to online reordering with the app for Android smart device using 4.0 or higher or iPhones, Apple Smart device with iOS 7 or higher or Android Wi-Fi® router and Internet connection. You can use WeMo® for automatically doing it all for you or manually run the humidifier with the buttons on the control panel. The two tanks with handles hold 2-gallons of water each with a daily output of 6.75 gallons covering 2500-square feet. You will have 5 comfort level settings and the run time is 60+ hours. The digital controls provide an automatic humidistat. Pure Evaporative Cool Mist Technology provides 100% filtered air at all times. The filters are conveniently located at the front and rear door panels. The cord plugs into a standard USA 110/120-Volt outlet, and is UL listed for use in the USA or Canada. The lowest fan speed is 24-Watts, medium is 72-Watts, and high is 89-Watts. 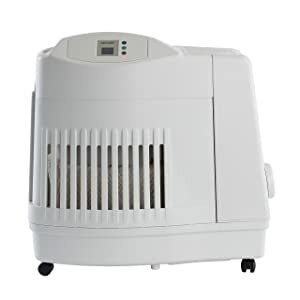 The Smart humidifier uses 2 HWF80-U filters using Arm & Hammer Baking Soda for filtering odors and impurities to prevent bacteria and mold from growing on the filters. This additive does not protect from microorganisms that could potentially cause disease. Do not add essential oils to this humidifier. The dimensions are 22” W x 22.5” H x 13” D and it weighs 19.4 pounds. It comes with instructions, a User’s Manual, and a 3-Year Warranty. The Honeywell® QuietCare™ Humidifier is an attractive evaporative unit with casters for easy movability from place to place. It holds 3.4 gallons of water with a 9-gallon output each day designed for 2300-square feet running up to 24 hours with each filling of water. Dual tanks are provided for peak performance and with wide opening tops, make it easy to use and clean. Its QuietCare™ Technology offers comforting humidity and is 30% quieter than its competitors are. 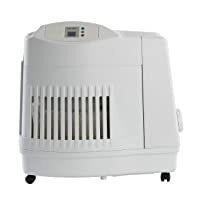 This is an evaporative humidifier and will not cause the white residue and dust associated with mist humidifiers. Evaporative units blow air across a wick filter. Water crawls up the wick and evaporates as the dry air passes over it. The white dust is caused by minerals in hard water. It has a built-in humidistat to measure humidity. It does not have a thermometer for measuring temperature and does not need one. It will automatically shut off when the tanks are empty. Three moisture settings are available on the humidity control knob on top and this humidifier runs quieter than others do. The Air Washing Technology uses pre-filters that trap pollen, dust, and dirt. 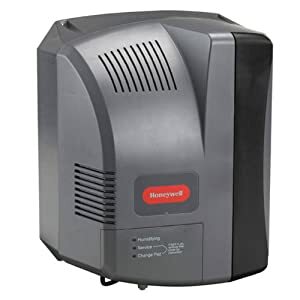 The Honeywell® uses a Protec Cleaning Cartridge and the Antimicrobial-treated master filter stops the migration of fungus, bacteria, mold, and waterborne algae providing cleaner and fresher air you breathe. The special cleaning cartridge extends the filter’s life. Replacement filters HC-14 are available on Amazon. It is recommended you put the humidifier on a ceramic surface to reduce any noise vibration. The cord plugs into a standard USA 110/120-Volt outlet, and is UL listed. The dimensions are 23.2” W x 17.5” H x 15” D and it weighs 20 pounds. It comes with a User’s Manual, instructions, and a 3-year Limited Warranty. 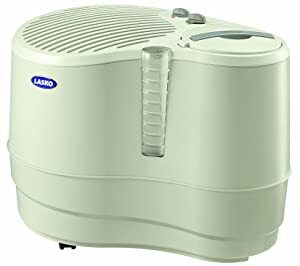 The Lasko® 4.5-gallon tank puts out 9-gallons of humidification with its variable 3-speed motor and will humidify up to 3200-square feet. It disperses invisible moisture without white dust for clean air to breathe in. The water tank has 2 handles so that it is easy to remove for filling and cleaning. With an adjustable humidistat, you will see an on/off indicator light. It is ETL certified (Electrical Testing Laboratories) with a patented fused safety plug. ETL means the unit meets safety requirements. The unit does not automatically shut off. The cascading waterfall indicates that the unit is working. The casters can be left off or put on for easy moving on hard floors. The 5-foot cord plugs into a standard USA 110/120-Volt outlet, and is UL listed. It comes with an evaporative filter pad THF 8 and they can be reordered on Amazon. The dimensions are 22” L x 14” W x 17” H and it weighs 20.4 pounds. It comes with instructions, a User’s Manual, and a 3-year Warranty. Aprilaire® is a leader in humidifiers since its inception in 1954. This superb 24-Volt digitally controlled unit provides all the comfort you will need for humidity in your home. It comes with a built-in bypass damper with handle for controlling that distributes more than 50% more moisture than its competitors do. The unit Installs in the supply or return plenum of a forced-air furnace. The Model 600 uses the furnace blower to move air through the Water Panel®. It will cover up to 4000-square feet using a water panel evaporator to put out 3-gallons each hour and lets you know when to change the filter about once each year. It provides the highest evaporation rate in the marketplace today at 0.70-gallons. The unit is quiet and easy to maintain. The control panel shows relative humidity with a test and reset button. This unit will give you vital service, temperature, and relative humidity indicators in manual mode as well. The Aprilaire® 600’s drain-through technology leaves no standing water once the humidifier turns off; therefore, no bacterial growth will occur because it is dry. The dimensions are 15-29/32 W x 18” H x 10-11/32” D and it weighs 8.5 pounds. It comes with instructions, and a User’s Manual. The Aprilaire® 600 must be installed by a licensed HVAC (Heating Ventilation and Air conditioning) professional. Aprilaire® humidifiers carry a 5-year Limited Warranty on parts from the date of installation, when installed by a licensed HVAC installer. If not done by an HVAC contractor, the warranty is void. The Aprilaire® 800 steam humidifier provides whole-house humidification for large homes up to 6200-square feet. With the automatic digital control, it will provide high levels of humidity. The control can also be operated manually. It is quiet and maintenance is easy and simple only requiring a replacement canister. It will work with cold water that is hard or soft. This powerful humidifier puts out 11.5, 16.0, 20.5, 23.3, and 34.6 gallons each day, depending on the electrical draw. The unit connects to your existing HVAC ductwork, at either the supply or return side via a steam dispersion tube. It does not work with a boiler system. A dedicated 20-Amp circuit is required. It ships wired for a 240-Volt circuit drawing about 2000- to 3000-Watts at full power input; about 11.5 Amps. It can be wired with a UF (underground feeder) cable, 12-AWG, grounded, preferably hard-wired to a fusible disconnect. With multiple voltages, be sure to use plugs to coordinate with the voltage. The dimensions are 15-3/8” W x 15-3/4” H x 10-1/4” D and weighs 23 pounds. It comes with instructions and a User’s Manual. The Aprilaire® 800 must be installed by a licensed HVAC (Heating Ventilation and Air conditioning) professional. Aprilaire® humidifiers carry a 5-year Limited Warranty on parts from the date of installation, when installed by a licensed HVAC installer. If not done by an HVAC contractor, the warranty is void. 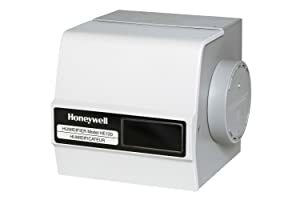 The Honeywell® HE120A is a gray color and is a drum humidifier with easy installation with the included kit. The unit includes a humidistat for knowing and controlling your relative humidity. Humidity will cover up to 2000-square feet. 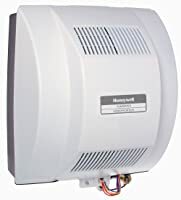 The remarkable and reliable Honeywell® whole-house humidifier works in conjunction with your furnace to sustain a proper, comfortable humidity level throughout your house. It will not rust, warp, or corrode being made of a heavy-duty durable thermoplastic. A drain is not required states Honeywell®, but that is dependent on each situation. The reversible components and snap-lock fittings make it a breeze to install. The 120-Volt power cord is provided. The electric rating is 24-Volt, 0.125-Amps. The plenum duct opening is 8.5” W x 6.625” H and the by-pass duct opening is 6-inches. The replacement pads, HC12A1015, are available at Amazon. The dimensions are 10.94” W x 12.75” H x 9.125” D and it weighs11.8 pounds. It comes with instructions and a User’s Manual with a 1-year Warranty. Honeywell® is an industry leader in home humidifiers. This evaporative fan-powered humidifier puts out 18-gallons each day covering up to 3000- to 4000-square feet. When the humidistat calls for water, the TrueEASE™ humidifier distributes water and air through the system. By not constantly cycling air, you will save money, energy, and use less water. Humidity makes the air feel warmer, allowing you to turn down the thermostat on your furnace. Install the unit vertically (not horizontally) for the help of gravity to pull the water down. You will have no issues with tight spaces with piping or water heaters when using the TrueEASE™ snap-lock fittings. The unit does not need to be disassembled for replacing the HC26A1008 filter pad available on Amazon. It is treated with AgION Antimicrobial Agent. An automatic damper is included and the LED lights let you know when it needs service. The power is 120-Volt 50/60 Hz and 1-Amp. The dimensions are 15.5” W x 16.75” H x 10.375” D and it weighs 15 pounds. It comes with instructions and a User’s Manual with a 5-year Warranty. 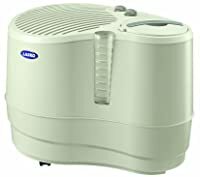 All humidifiers listed here are made in the USA. up to 2300 sq. ft.
up to 4200 sq. ft.
up to 3200 sq. ft.
up to 2800 sq. ft.
up to 6200 sq. ft.
up to 2600 sq. ft. Different varieties of humidifiers for a central system—entire house or whole-house—are dependent on what you want to accomplish and what your budget allows. The central humidifier attaches to your forced air furnace between the hot air ductwork and cold air return for heat, air conditioning, and humidification to enter the rooms of the house. The hot air is redirected into the humidifier, and the air being hot and pressurized, will hold the moisture going back into the cold air return to be heated again. This air is sent into the house as water droplets evaporating into the home’s air in all rooms via the air vents in each room. Each room should have an air return, but sometimes a large air return is created by HVAC technicians for a new furnace installation to accommodate the need based on square footage and power of the furnace. The basic types of humidifiers are Bypass, Fan, and Steam. Bypass Humidifiers use the warm air from the forced air furnace to put moisture into the air in the home. They do this by pulling warm air from the heat ductwork then sending it through a water panel, known as a filter that distributes vaporized moisture into the entire house. These units are installed on the supply or return air plenum (where air is pressurized for circulation) of a forced air system. When there is no floor drain, there are drainless bypass humidifiers offered in the marketplace. These units recirculate their own water, saving on water usage, and plumbing to remove condensation. The bypass is middle of the road considering functioning and cost. 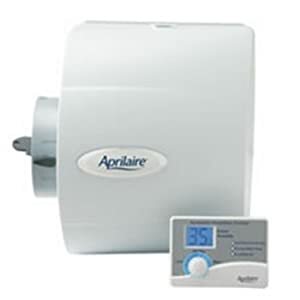 A good example of a bypass humidifiers are the Aprilaire® Bypass Humidifiers. Fan-Powered Evaporative Humidifiers work similarly to the bypass humidifier except it uses a fan to blow the air across the water panel filter pad to boost the water evaporation. These units can produce a gallon or more of moisture daily compared to the bypass types. These humidifiers do not use bypass ductwork so it can be installed in smaller spaces that are great for homes built on concrete slabs or a furnace installed in a closet room where there is a crawl space under the house. The Honeywell® HE300A1005 TrueEASE™ is a good model. Steam Humidifiers heat water until it boils to put moisture into the air in the form of steam. It is sometimes called a mist humidifier. The blower in the furnace sends the steam through the house by the ductwork through the vents into the home. This is a fast and efficient method for comforting humidity. This type of humidifier will provide moisture as needed and is the most expensive. The Aprilaire® 800 is a good steam humidifier to consider. This unit works independently of your HVAC system for larger homes. 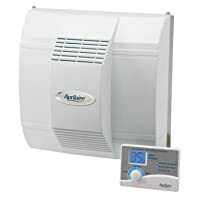 The Aprilaire® 800 Automatic Whole-House Steam Humidifier is a good unit for specific house sizes. Humidification is the process of adding moisture to the air and is one of the most important aspects of total indoor comfort. A whole-house humidifier is designed to cover the entire house, but it is still important to check its actual coverage. Some units can be used in a house that is 4000-square feet and some can only humidify up to 2500-square feet. If you are looking only for a humidifier that humidifies a baby’s room, please click here. The higher the evaporation rate means the more the air will become saturated with moisture over a specific time. A humidifier with an automatic humidistat will calculate the humidity and adjust the moisture output as necessary. Some units have automatic control features and others have manual controls. It’s a personal preference and a budgetary consideration for what works for you and your needs. Humidifiers that interface with a gas-forced air heat furnace might require a licensed HVAC professional to install. Some manufacturers will void their warranty if the installation is done by a do-it-yourself person. Check maintenance requirements to avoid spending money and time unnecessarily. Today’s humidifiers are so technologically advanced that only a minimum amount of cleaning is required with filter changes. When days get colder, or if you live in a warm dry climate year ‘round, you will want to put humidity into the living environment with your body benefiting with a humidifier. Most everyone is aware of the small portable humidifiers and vaporizers used for babies. The tank is filled with water and the unit is moved from room to room and when the water runs out, you fill it again or turn it off. If you want to relax in an aromatic environment, check out the Essential Oil Diffusers. Do not put essential oils into humidifiers! 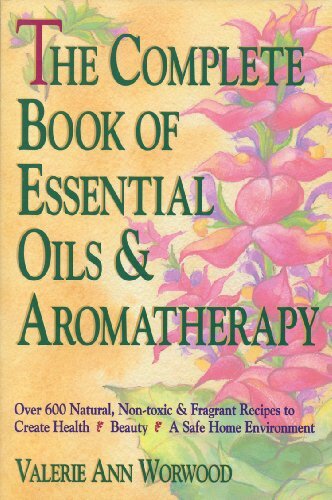 Do not use essential oils in any humidifier even if the manual does not address it. The oil will gunk up the works. Hard water creates minerals that adhere to the unit. It would be best for your humidifier to use distilled water. Boiling hard water will not remove minerals. For every degree you drop your thermostat, you will save up to 4% on your energy bill each month. We hope that humidifiers have been demystified and that you have enough information to make an informed choice. Pick My Humidifier will show you how with the whole-house humidifier evaluations. Enjoy your humidifier, follow the electrical requirements, and with proper maintenance and care, it will last for many years. Thanks for posting. Pretty basic stuff, that we all forgot to do on a day to day basis. We get so busy with whatever, that we forgot what a difference these things can make. Thanks! Isn’t the rate the output per hour in gallons? is it 3 or .7? The Water Flow rate for Aprilaire 600 is 3 gallons per hour(in Model 700 is 6GPH), and .7 is the Evaporation Capacity(or Evaporation Rate). We’ve been using a Honeywell Tru-Steam in a closet, piped down into the main heating duct, and with a Reverse Osmosis water filter. Although we have .9 water we haven’t had to clean the “pot” in years. Prior to the RO unit it was chisel-the-minerals out every month or so. We still open the pot every service notice, then smile at the still clean pot and reassemble it. Is there any recommendation for a good system that will work with horizontal flow ducting? Our furnace is horizontal in our crawl space and I’m seeing a couple high quality humidifiers saying not to use with horizontal ducting. Thanks. I’m looking for a whole house humidifier that will be compatible with the humidistat in my nest thermostat and relatively easy to install. Any suggestions?